What is the Difference between Dhow Cruise Marina and Creek? If you are doing your research about the places to see and things to do in Dubai for your impending holiday in this Emirates city, you would have surely come across dhow cruise as a popular activity. The dhow cruise is available on Dubai Marina as well as on Dubai Creek. Before you book a dhow cruise dinner or sunset cruise, it is important to know about dhow cruise Marina v/s dhow cruise so that you can make an informed decision. A dhow cruise happens on a traditional dhow that has been transformed into a restaurant. The Arabic dhow vessels were used for transportation in the bygone days. Although the wooden dhow vessels, which usually have an upper deck as well as a lower deck, look like sophisticated fine dine restaurants, they still have an old world charm and reflect the Bedouin culture of the past. 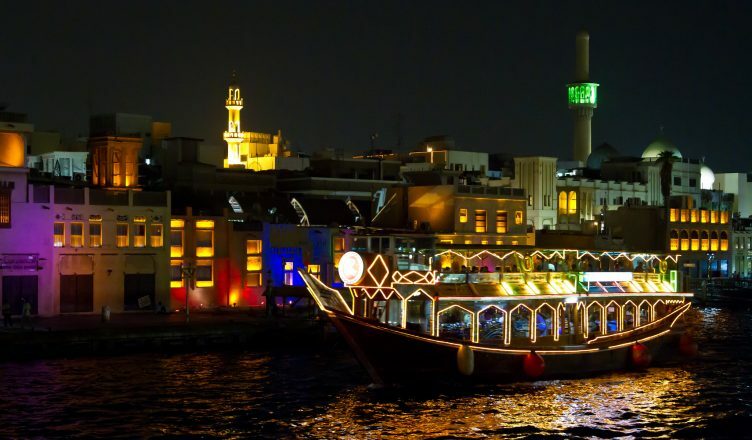 While sailing along the cost of the Dubai Creek or Dubai Marina, you get to enjoy a delicious dinner with both Arabic and international cuisine. Apart from soulful music, you would also get to see the amazing Tanura dance performed by a professional. A dhow cruise is not only a great way to relax but also to know and experience the Arabic culture and hospitality. Dhow cruises are majorly available on Dubai Marina and Dubai Creek, two of the prominent areas of the city. The Dubai Creek belongs to old Dubai, a place where the Arabs settled when they relocated to the city from villages in the desert. The Dubai Creek divides the city into two areas Bur Dubai (old Dubai) and Deira (new Dubai). On the other hand, Dubai Marina is the newer version of new Dubai. It is an artificial canal city with high rises and fine examples of modern architecture on both sides. It is home to some of the most luxurious hotels, unique cafes and restaurants as well as quaint boutiques. What to Choose: Dubai Creek or Dubai Marina? If you are holidaying in Dubai for the first time, you are likely to be confused about which one to choose. This entirely depends on your preferences, tastes and of course, budget too. Here, we have listed out some of the differences between the dhow cruises in these two places to make it easier for you to decide. 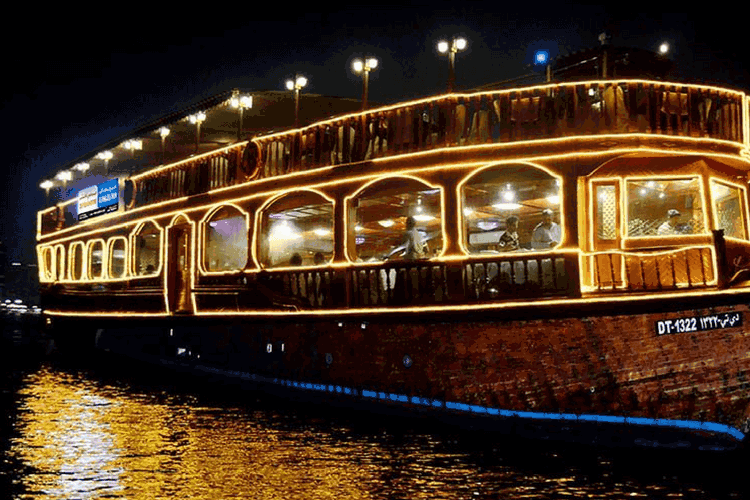 Apart from the food and entertainment, one of the most important things that makes dhow cruise dinner attractive is that you get to see the beautiful sights of Dubai. While both Dubai Creek and Dubai Marina offer a great sightseeing opportunity, there is a stark difference between the places. The Dubai Creek has a limited number of sights as compared to Dubai Marina. On the Bur Dubai side of Dubai Creek, a promenade covers most of the area leaving nothing much to see. However, when the promenade ends, you are awarded with the sights of the historical part of the city, i.e. the Bastakiya Quarter. You would get to enjoy the sophisticated architecture of the past as well as souks, palaces and a heritage village. On the other hand, on the Deira side of the city, you would get to see some prominent buildings including Dubai Chamber of Commerce, National Bank of Dubai, Sheraton, etc. Although these buildings do not have an exemplary style or architecture, they are icons in their own right. While the dhow cruise on Dubai Creek gives you a glimpse of the old and historical side of the city, the Dubai Marina shows you a totally different city. Dubai Marina is everything that the city is known for: luxury, opulence, style and entertainment. During the dhow cruise dinner, you would get to see a gorgeous skyline, adorned with buildings that have a distinct style and architecture. Moreover, while sailing along the Marina, you would get to experience trams and cars passing over the bridges over you. There are also several cafes and restaurants too. Apart from all this, you would also get to see luxury yachts, leisure vessels, etc. on Dubai Marina. One of the major deciding factors when it comes to dhow cruise Marina v/s dhow cruise Creek is the cost. The dhow cruise Dubai Marina price is much higher compared to that of Dubai Creek. 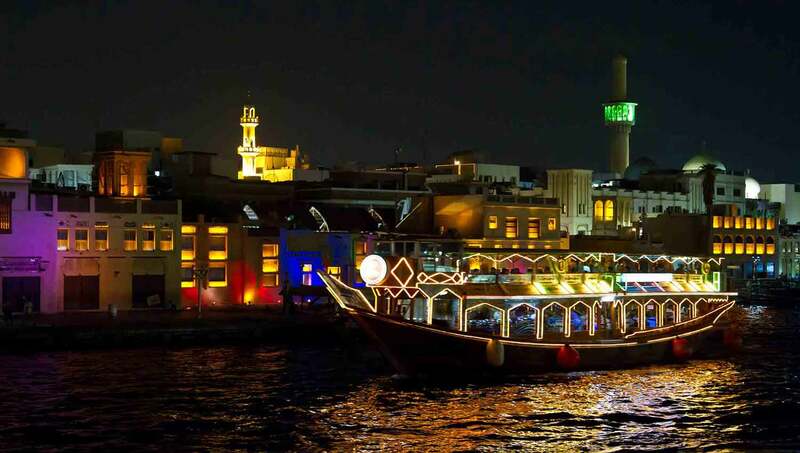 You can go on a Dubai Creek dhow cruise dinner at a cost of around AED 65, while the cost of a dhow cruise dinner on Dubai Marina is almost double. However, people who have gone on both dinner cruises have said that while Dubai Marina charges more, it also offers better services. Right from the food to customer service, everything is of higher quality than the dhow cruise on Dubai Creek. The mood of both the places also plays an important role in making a decision. The Dubai Creek has more hustle bustle that is associated with daily routine. The traffic, daily business routine and barges departing to ports make the ambience of the place. On the other hand, Dubai Marina focuses more on leisure and entertainment. You would see people having a leisurely walk along the promenade or having coffee or a meal at one of the restaurants. The atmosphere is livelier at Dubai Marina.